In the early 1940s Sergei Eisenstein wrote a series of articles on the animated cartoons and films of Walt Disney, (published as Eisenstein on Disney) admiring and envying the protean nature of the animation media – the ability of the animator to draw (or create in whatever medium) whatever came into his or her imagination, and to express that directly in their films, often more-or-less single-handedly. In the period that Eisenstein was writing of (1930s-1940s) this total freedom was of course denied the live-action film-maker, who was limited to a palette of cinematography, in-camera effects, optical special effects, editing – and of course the essential métiers of fictional film-making – the production design, costume, make-up, styling, editing and (later) sound, music, colour, etc. In animation, of course all these skills could be, and often are, under the control of a singular creative artist-animator, or at most a small team of animators who handled the in-betweening – the drawing of the frames that ensured smooth animation between master frames drawn by the chief animator. Other artists might be deployed painting backgrounds, making the sound-track, voice-recording, music and sound effects, etc. Emile Cohl: Fantasmagorie 1908. 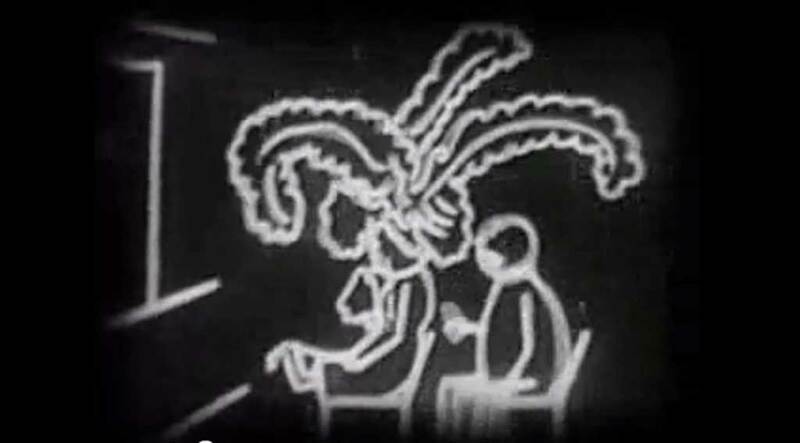 Emile Cohl has been described as the ‘originator of the cartoon film’, and in their classic work The Technique of Film Animation (British Film Academy 1959), John Halas and Roger Manvell describe his work: “The French pioneer Emile Cohl put a series of black-line drawings on sheets of white paper and photographed them. On the screen he used the negative film, and so achieved an action performed by white figures on a black background. It might be claimed in his case that he was less concerned with developing any technical skill than with showing the simple charm possessed by his little match-stick creatures. Even at this primitive stage, the emphasis was artistic rather than technical.” Cohl was the first interesting animator, developing some of the basic techniques (principles) of animation – the idea of shooting a series of drawings and projecting these at a frame-rate fast enough (12 frames/sec) to fool our eyes and brains into seeing movement. At first working in France, he spent some time in the USA, teaching animation techniques. What Halas and Manvell have to say about Cohl is of course quite true, his animations were more a proof of concept than a technical demomnstration of how it could be done, However the illustration above shows that even this ‘humble pioneer’ was able to see how, and invent one of the stock-in-trade techniques that we now call ‘morphing’ (from morphology – study of form and shapes), whereby we gradually change one form into another in a sequence of minor changes) could create fascinating animations, and that animation itself could become not only a mass-cinema medium, but an art-form in itself. Emile cohl: Un Drame 1908. Cohl’s surreal style of drawing, fully exploiting what Eisenstein called plasmaticness – the ability to change or mutate or transform one object into another at will – illustrates the complete freedom of the artist. But at this period (1920s-1930s) it wasn’t just the animators who were exploring the seemingly infinite potential of drawing. New insights had come from the artist Paul Klee, based on his teaching practice at the Bauhaus c1920-1930. Klee published his ideas on drawing in two books: The Thinking Eye (covering 1921-22) and The Pedagogical Sketchbook. He annunciates the idea later deployed by the Surrealists of ‘taking a line for a walk’ – the Surrealists called this psychic automatism and invented randomised drawing games like the Exquisite Corpse to exploit this creativity. But other influences emerged from popular culture, notably in the then very young art of the newspaper comic strip, and in this metier, it is the drawing art of George Herriman and his remarkable series Krazy Kat that spring to the fore. 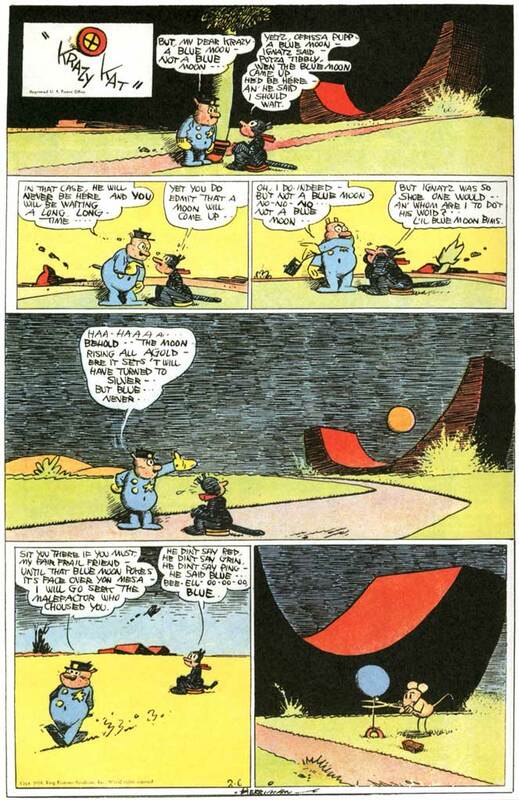 George Herriman: Krazy Kat 1938. Herriman is the great poet-artist of the comic form – a truly unique genius in this medium. His subtle, sardonic, insightful humour, married with his gentle surrealism – and the life with which he endows his tripartite cast of characters, makes this a really exceptional work. Ignatz the mouse hates Krazy Kat, who in turn really loves him, and interprets Ignatz’ incessant brick-throwing as a sign of affection.Krazy hates Offissa Bull Pup who in turn loves Krazy and hates Ignatz. With this slender yet richly fruitful plot-idea, Herriman explores the vagaries and frailties of the human condition and our attempts to relate to others – producing delightfully spare drawings in a series that picture the Jewish Ignatz, the black Kat and the WASP Pupp in a strangely urbanised Arizona Desert (Coccocino County) a landscape that often morphs radically from frame to frame. Herriman drew this strip from 1913 to 1944. I’ve chosen to situate this in 1924 because it was the year that the art critic Gilbert Seldes wrote an appreciative paper on Herriman’s Krazy Kat, that positioned it as ‘serious art’. With his playfully surreal plots, his inventive drawing and experimental frame layouts, Herriman exerted an enormous influence on the development of the comic-form. 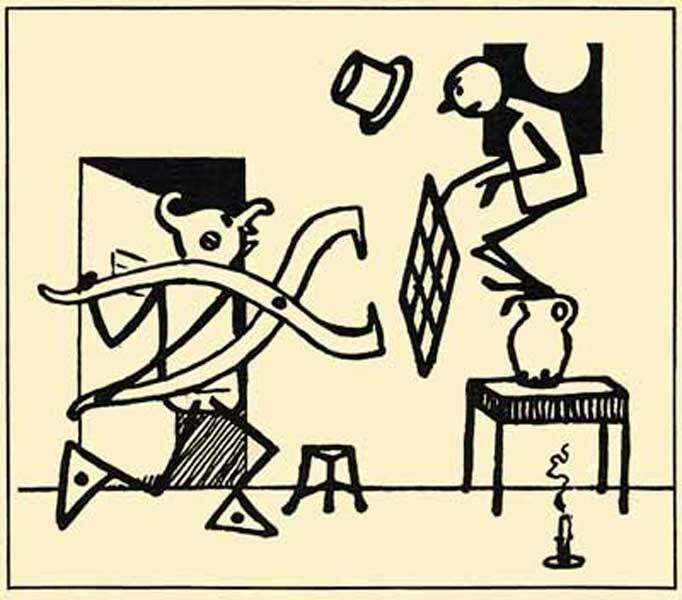 Herriman epitomises the artist-draftsman, adventurous, innovative, practising Paul Klee’s advice to draw by taking a line for a walk. Dave Fleischer: Betty Boop in Snow White 1933. 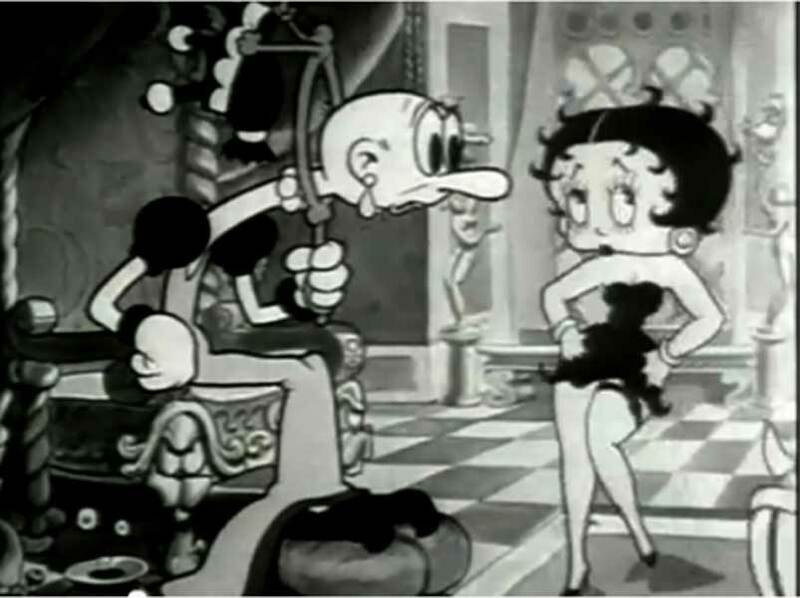 Fleischer – always an innovative animator – epitomises the expressive morphing and distortion of characters – here the Evil step-mother is asking her mirror who is the most beautiful one of all? when Betty (Snow White) enters the room. 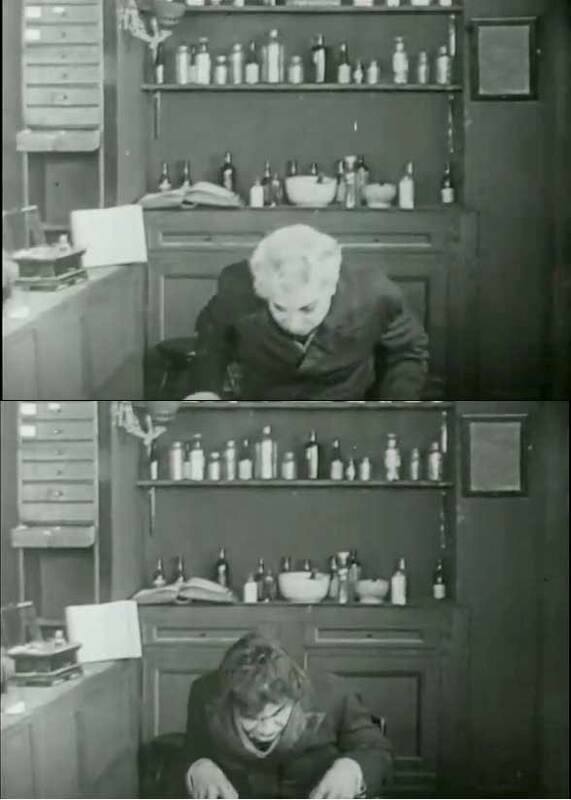 Lucius Henderson: Jekyll and Hyde (1912). As you can see Henderson relied on just about the simplest possible transition shot – Dr Jykell drinks the potion, bends down, there is a cut, and when he raises his head he is Mr Hyde. Other film-makers used short lap dissolves to achieve the transition – fading out on Jykell, cross-fading in with Hyde – a technique used on the very cusp of digital morphing software by Kevin Godley and Lol Creme in the elegant promo-video for their hit single Cry (1985). The first morph software that I came across was Gryphon Software’s Morph, available for the Mac around 1991-2. Live-action film-makers utilised animation techniques of course, using stop-motion to gradually expose sequences that animated otherwise inanimate objects, or that ‘animate’ still photographs in a similar way. Or artists could paint, draw or scratch marks straight onto the film-stock, creating a camera-less animation technique. The Canadian Norman McLaren and New Zealander Len Lye excel at these kinds of animation (we’ll look at their work in a future post). Godley and Creme use the early portrait-photography head-rest in their 1985 promo-video Cry. Godley and Creme: Cry 1985 Kevin Godley and Lol Creme were innovative film-makers as well as talented musicians. In their promo-video for the single Cry, they use a head-rest to help pin-register the eyes of several participants as they lap-dissolve between them. I talked to Kevin Godley a few years later about this video, and congratulated them on a successful use of an established optical effects to achieve this. Of course, from about 1991-2 onwards, software companies like Gryphon had developed desktop versions of morphing tools (Gryphon’s Morph (c1992). 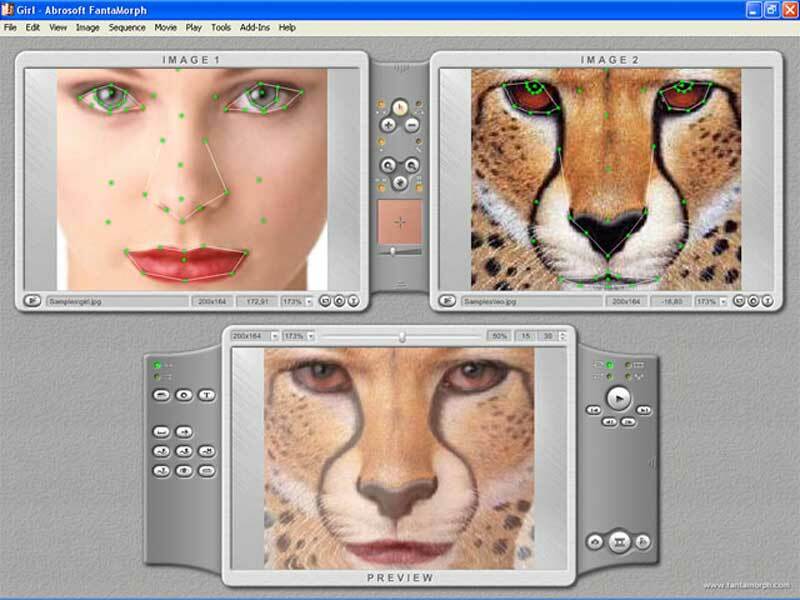 This enabled the user to input two images, and control an automatic morph between them, controlling reference points for each image, specifying the number of in-between frames, and the output resolution and format. Fantamorph desktop software. Most desktop morph solutions allowed you to input two resource images, then indicate which features should be retained in the final morph. By the mid 1990s, the digital-film revolution was already underway on desktop computers like the Mac. We had software for non-linear editing (Adobe Premiere 1991) for compression (MPEG-2 1994, and Quicktime (1991). And with Gryphon’s Morph, we could make high-resolution animations from still images. Digital media has in the last twenty years or so, given us the tools by which we can successfully marry live-action cinematography with the effects taken for granted by hand-animators (cel and claymation animators) over the previous century. Another important step on the road to the development of Total Cinema.